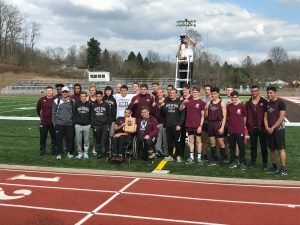 Congratulations to the boys varsity track team for capturing the East Palestine Invitational by scoring 112 points. Crestview was the runner-up with 85 points out of the 19 team field. Capturing first place for the Spartans were Mitchel Dunham in the 1600 (4:28.14), Payton Torres in the 800 (2:04.05), the 4 x 400 meter relay team of Christian Ortiz, Payton Torres, Isaiah Suarez, and Brennon Stratton (3:33.57), and Nikita Missos in the discus (145’0”). Sophomore Micah Beckwith set four new meet and stadium records in the seated events. He won the 100 (20.79), 400 (1:17.99), 800 (2:41.43), and the shot put (12’9). The Spartans placed in every event and displayed their team depth in leading the way to victory.